On the evening of September 24, five of the original actors who played Munchkins in “The Wizard of Oz” will make a rare appearance, their first ever in Manhattan; Lorna Luft will honor her mother’s legacy with a special musical tribute performing “Rock-A-Bye Your Baby” as well as a Wizard of Oz medley composed especially for the Gala; and Grammy Award winning singer/songwriter and actress Ashanti, who recently played Dorothy in City Center Encores! production of The Wiz, will sing “Somewhere Over the Rainbow.” All this will take place at Warner Bros. Entertainment’s highly anticipated Emerald Gala at Manhattan’s historic Tavern on the Green in celebration of the 70th anniversary of The Wizard of Oz. At sundown, the famed lights of the Empire State Building will glow emerald green in honor of the American film classic’s milestone. The exclusive event will also be highlighted by the auction of Warner Bros. Consumer Products’ Ruby Slipper Collection and Inspirations of Fine Art Collection, benefiting the Elizabeth Glaser Pediatric AIDS Foundation (EGPAF), and the heralding of Warner Home Video’s September 29 Blu-ray and DVD release of The Wizard of Oz 70th Anniversary Ultimate Collector’s Editions. The Emerald Gala will launch the last season of extravaganzas under the LeRoy family’s ownership of the iconic restaurant, known and loved by patrons from New York and the world over since 1974. The entire restaurant and surrounding grounds will transform for a night into the Emerald City, replete with a winding “Yellow Brick Road,” fields of poppies, and a special appearance by the seven-and-a-half story stunningly decorated Wizard of Oz Hot Air Balloon. Multi-platinum recording sensation Ashanti will grace the stage to perform Somewhere Over the Rainbow and The Way That I Love You at the star-studded gala event, highlighted by the charitable auction of Warner Bros. Consumer Products’ Ruby Slipper Collection and select pieces from Inspirations of Fine Art Collection to benefit long time philanthropic partner, the Elizabeth Glaser Pediatric AIDS Foundation (EGPAF). Joining the stage with Ashanti will be a full band and four talented musical prodigies from a local New York high school. The orchestra members, Joshua Epstein, Kathryn Mattner, Joanna Rose-Gross and Jenny Yiu, were hand picked from North Shore High School by Musical Director, Marvin Floyd. The Munchkins – Ruth Duccini (Villager), Jerry Maren (Lollipop Guild Member), Margaret Pellegrini (Flowerpot Hat Dancer), Meinhardt Raabe (Coroner and oldest living Munchkin, who proclaims “The Witch is Dead”); and Karl Slover (1st Trumpeter) — have not appeared together publicly since their 2007 Walk of Fame honors and prior to that at a 2005 screening at the Academy of Motion Picture Arts and Sciences in Beverly Hills, CA. Also making a special appearance at the grand affair will be the cast of the highly celebrated The National Tour of The Wizard of Oz, with Dorothy and Toto, Scarecrow, Tin Man and the Cowardly Lion, all adding fun and excitement down the “Yellow Brick Road.” The cast will perform If I Only Had a Brain on the main stage in the Garden of Tavern on the Green. 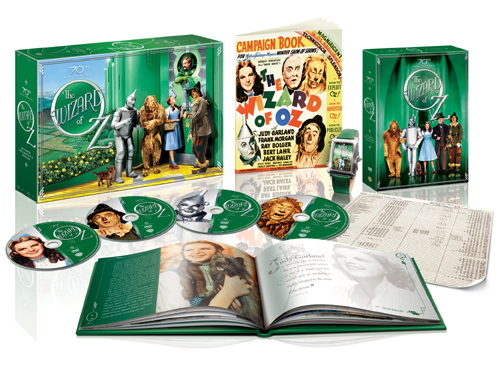 Warner Home Video’s September 29 Blu-ray and DVD release of The Wizard of Oz 70th Anniversary Ultimate Collector’s Editions will mark an historic benchmark in the Blu-ray format as the studio continues to maximize what Blu-ray can do for picture and sound. With six times higher resolution than standard DVD along with unparalleled sonic excellence, the film will be at its absolute pristine best, packed with treasured collectibles and brand-new bonus content. Guests at The Emerald Gala and around the world have the opportunity to bid on Warner Bros. Consumer Products’ renowned Ruby Slipper Collection and select works from The Inspirations of Oz Fine Art Collection at rubyslipperauction.com, with proceeds benefiting EGPAF. The auction opened September 10, with final bids closing and tabulated on September 30. HIT Favorites: Trick or Treat Tales and Shaun the Sheep: Little Sheep of Horrors will be released just in time for Halloween on September 1, 2009. 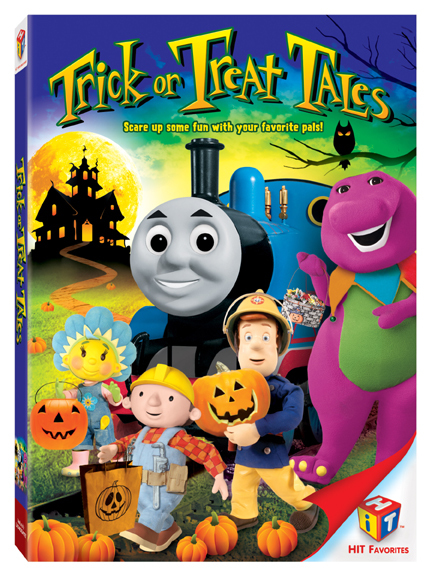 HIT Favorites: The thrills start with Thomas & Friends™ in a ghostly adventure. Bob The Builder™ and Spud put on scary faces to protect a giant pumpkin pie from hungry crows. Barney™ and Fifi learn that there’s more to a costume than just dressing up. Angelina Ballerina™ sneaks into a costume ball and Fireman Sam™ saves a furry friend from a chilling experience. Enjoy the season’s sweetest collection of Trick or Treat Tales! Shaun the Sheep: What’s black and white and goes bump in the night? Don’t be scared – it’s your woolly friend, Shaun the Sheep! Join Shaun as he leads his fearless flock through six adventures that mix the spooky, the kooky, and the just plain funny. A troublesome tractor, freaky farm noises and sleepwalking sheep are only a few of the weird and wonderful surprises waiting for Shaun and his barnyard pals as they creep, sneak and make mayhem in this laugh-filled collection. 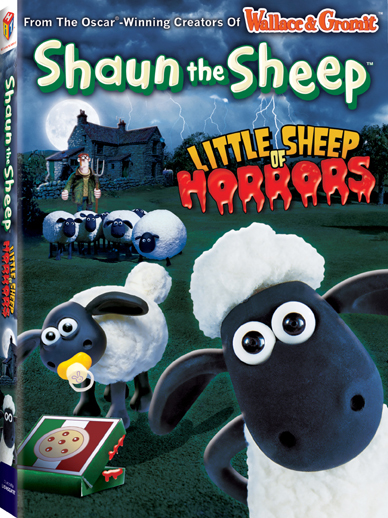 * “Little Sheep of Horrors” – Intrigued by a horror film on TV, Timmy wanders into the Farmer’s House, and Shaun’s rescue mission wreaks panic. * “Abracadabra” – When the Farmer decides to throw out his magic set, Shaun decides to put on a show – but things get out of hand when the flock start disappearing! * “Things That Go Bump” – On a dark and stormy night the flock cannot sleep – Shaun discovers the culprits. * “Heavy Metal Shaun” – The farmer inspects the lawn with a metal detector. When Shaun and Bitzer try it, they discover a metallic threat behind a hedge. * “Sheepwalking” – It is a peaceful night at the farm, until Shaun starts to walk in his sleep. The Flock cannot resist their natural instinct to follow, and chaos soon ensues. I love this DVD. It really puts things into perspective. The world is a very big place with so many faces in so many places, too many to picture, let alone know. But what if you could take the world’s population – over 6 billion – and see it within the confines of one united community of 100? Find out in the delightful and insightful If the World Were a Village, a story about the world’s people coming to DVD September 8, 2009 from Master Communications, Inc.
Based on David J. Smith’s best-selling, award-winning book, If the World Were a Village is an animated story that delivers an enlightening message and explores how general global statistics about age, language, economic and educational status, food and culture would break down if looking at only 100 people. · 61 would be from Asia, 13 from Africa, 5 from North America, 8 from Central and South America, 12 from Europe and 1 from Oceania (Australia, South Pacific, etc). · More than half would speak one of eight languages: Chinese, Hindi, English, Spanish, Portuguese, Bengali, Arabic and Russian. · Represented faiths would include Christianity, Buddhism, Judaism, Muslim and non-organized religions. · 39 people would be under 19 years of age, 42 would be between ages 20-49, 18 would be older than 50 and 1 would be older than 80. If the World Were a Village is a unique and objective resource, inspiring children to discover that life in other nations is often very different from their own. The compartmentalized stats, along with Smith’s tips on building “world-mindedness,” will encourage viewers to embrace the bigger picture and help establish their own place in the international landscape. Chapters include: Welcome to the Global Village; Nationalities; Languages; Ages; Religions; Food; Air and Water; Schooling and Literacy; Money and Possessions; Electricity; Village in the Past; Village in the Future; Teaching Children About the Global Village; a Note on Sources; and How the Calculations Were Made. 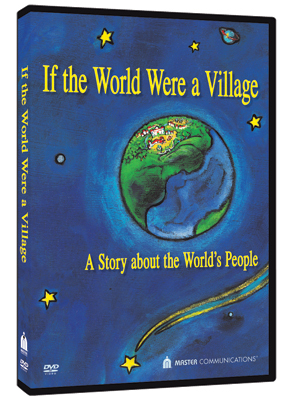 If the World Were a Village has been honored as a 2006 Prix Jeunesse International Finalist, a 2006 Gemini Award Nominee for Best Direction and won the 2007 Alliance for Children & Television Award of Excellence and the 2007 Canadian Screenwriting Award. Join Barbie and her friends in this action packed adventure where impossible dreams can come true. 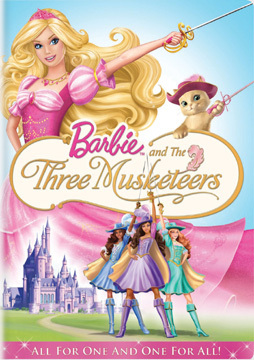 Barbie returns as Karin, a young girl in France who wishes to become a musketeer and protect the Prince. As Karin reaches Paris and the King’s castle she quickly finds out that no one believes a girl could possibly be able to protect the Prince. Determination keeps Karin in Paris and she soon gets a job as a maid in the castle. After making friends and showing off some of her musketeer moves, Karin discovers her fellow maids have the same dream of saving the Prince. Witness the four girls as their friendship grows and they train in hopes that one day they will be able to prove themselves. Their opportunity comes soon enough when they discover a plot to kill the Prince. When no one believes what they have uncovered they must prepare to save the Prince on their own. This inspiring story proves that any dream is possible, whether it is the wish to be the first man to fly or the first girl to become a musketeer. With Karin’s kitten training to become a musCATeer to defeat a bully bulldog there is constant comedy mixed with the inspirational message. Between the amazing acrobatics and the constant danger the Prince is in, there is never a dull moment in the King’s castle. Kids will be enthralled with the story, while learning that they should never give up on their dreams. Sweetening store shelves this fall with a brand new look is Strawberry Shortcake starring in her first ever, CGI feature movie The Strawberry Shortcake Movie: The Sky’s The Limit premiering on DVD September 15, 2009 from Twentieth Century Fox Home Entertainment, American Greetings Properties, and Cookie Jar Entertainment. Life is berry sweet in Berry Bitty City where Strawberry runs the Berry Café. When a boulder blocks the town’s water supply, Strawberry must find a way to rescue the town, and learns that when you have good friends and faith in yourself, any challenge can be overcome. Meet Strawberry’s new friends Orange Blossom, who runs the Orange Mart general store, Raspberry Torte of the Fashion boutique, and Blueberry Muffin, owner of Blueberry Books, and other Bitty City girls. The Strawberry Shortcake Movie: The Sky’s The Limit also introduces the magical Berrykins, mischievous little creatures who grow and harvest berries from the nearby strawberry fields. In this brand new adventure Strawberry and her friends share a positive “anything is possible” attitude. A sudden storm leaves Berry Bitty City with a gigantic problem. Strawberry Shortcake and her friends will have to movie their whole tiny town unless they find a way to safely remove a huge boulder that threatens everything they hold dear. The storytelling Mr. Longface Caterpillar says he has an easy solution. Strawberry reluctantly agrees to follow him in an adventure-filled journey in search for his fabled Geyser Stone. When that journey ends in failure, Strawberry loses faith in herself. Can her friends restore her “Sky’s the Limit” attitude to help lead them to save the town. Peep! Peep! 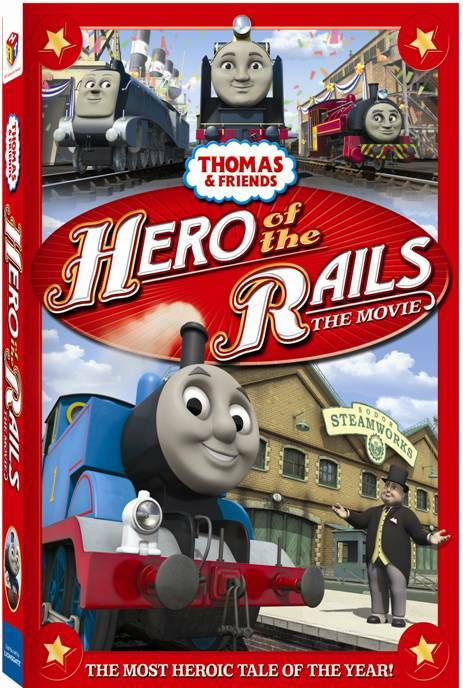 All aboard for new friends, new destinations, and new voices when Thomas and his engine friends embark on their greatest adventure yet as Thomas & Friends™: Hero of the Rails steams onto DVD September 8, 2009 from Lionsgate and HIT Entertainment. See and hear Thomas, Percy, James, Gordon and all the other engines as never before in this brand-new CGI-animated movie, which marks the debut of individual character voices for the engines. For the first time, fans will hear the voice of Thomas and his friends, including three new characters who debut in Hero of the Rails, as they share stories that lead to timeless life lessons of discovery, friendship and cooperation. In this action-packed tale of friendship, determination and teamwork Thomas discovers an abandoned and broken down engine named Hiro from an exciting far away land. Fearing that he will be scrapped, Thomas enlists help from many friends including Victor, a new steam engine and Kevin, a new crane vehicle who both work at the spectacular Sodor Steam Works. But mishaps, mistakes and one boastful engine could foil their plans for a heroic rescue. Can the engine pals work together to help their new friend? Join the adventure and find out! You are currently browsing the Granny Ranny's Coming Attractions weblog archives for September, 2009.